The Denver Broncos visit the Washington Redskins in Week 16 of the 2017 NFL season. PFF previews the top player matchups of the game. RB C.J. Anderson vs. LB Zach Vigil – It should be safe to assume that Anderson has regained the lead back role in the former three-man running back by committee. Anderson played 68.4 percent of the Broncos’ snaps last week, his highest percentage since Week 4. He has now seen his snap percentage increase in three straight games and looked great against the Indianapolis Colts, averaging 3.4 yards after contact per carry. Vigil has been solid against the run this season, evidenced by his 77.9 run-defense grade (27th of 92 linebackers). In four games played this season, Vigil has recorded at least two stops in each game. WR Demaryius Thomas vs. CB Josh Norman – Thomas has accumulated 840 receiving yards this season on 483 total routes run. His yards per route run average of 1.74 ranks tied for 27th of 85 receivers with at least 40 targets. Norman has surrendered 454 yards on 415 coverage snaps, an average of 1.09 yards allowed per coverage snap (tied for 64th of 120 cornerbacks). Norman is coming off a great game against the Arizona Cardinals where he saw just one target into coverage on 51 coverage snaps. T Donald Stephenson vs. Edge Ryan Kerrigan – Stephenson has a difficult task in containing Kerrigan this week. When rushing from the left side, Kerrigan has accumulated 47 total pressures, tied for the ninth-most pressures by an edge defender from the left side. He rushes from the left on 85.7 percent of his pass-rush snaps, so he’ll line up against Stephenson plenty. Stephenson since his return to the lineup in Week 13 has had two bad games (three and five pressures allowed) and one good game (one pressure allowed). He could easily be in for a rough day against Kerrigan, though if he’s able to contain him it will certainly make things easier in the passing game. RB Kapri Bibbs vs. LB Brandon Marshall – In his first game with the team, the third-year back played 15 of a possible 51 offensive snaps, caught all four of his catchable targets, and racked up 47 yards and one touchdown, at an average of 4.27 yards per route run, the third-best mark among running backs last week. 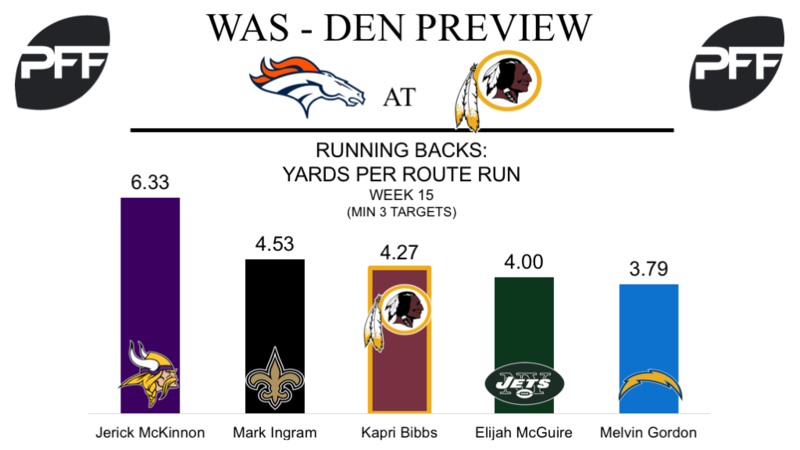 With another week of the offense under his belt, Bibbs will likely see even more action this week as he returns to play against his former team. During the contest, he’ll be trying to get the best of former teammate Brandon Marshall. However, Bibbs has the potential to come out on top of this matchup, as Marshall has surrendered an average of 1.18 yards per coverage snap and a passer rating of 118.9 on throws into his coverage this year, which rank 37th and 46th among inside linebackers this year, respectively. 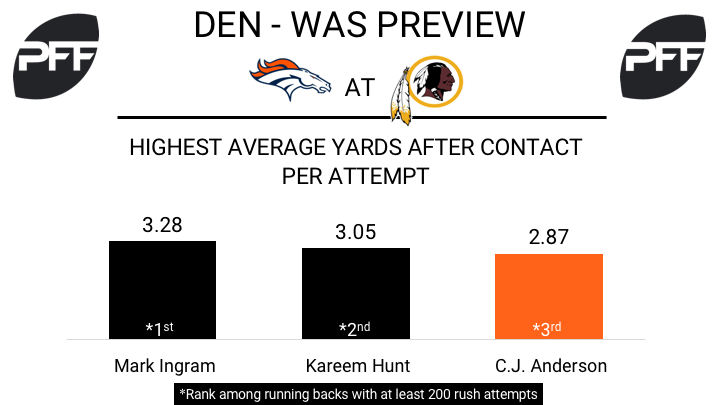 QB Kirk Cousins vs. CBs Aqib Talib and Chris Harris Jr. – With Cousins’ long-term future still up in the air, the sixth-year signal-caller has two games left to prove to the Redskins’ staff that he’s worthy of a long-term contract. Through 15 weeks, Cousins has once again put himself among the league’s top-tier passers in three key categories; he’s posted an adjusted completion percentage of 76.0 percent, a 77.1 passer rating under pressure, and a 111.6 passer rating on deep balls, which ranks seventh, 12th and third among quarterbacks, respectively. Entering Week 16, Cousins can impress teams further if he performs well against one of the best cornerback tandems in the NFL. Through 15 weeks, Talib and Harris have combined for three picks, nine pass breakups and have allowed just 0.60 yards per cover snap and 0.72 yards per cover snap, which ranks fourth and ninth among 120 qualifying cornerbacks, respectively. T Morgan Moses vs. Edge Von Miller – Throughout the season, the Redskins have fielded several different offensive line combinations as they tried to overcome a number of injuries up front. The one constant in those combinations has been Morgan Moses, who, despite playing with two injured ankles has managed to play 834 snaps, more than any other lineman on the team. However, injuries have taken their toll on him in pass protection, as he currently ranks 39th among tackles with a pass-blocking efficiency of 94.9, which would be his lowest mark since his rookie year. This week, he’ll arguably face his toughest matchup of the season as he goes up against Von Miller, who has racked up more pressures (73) than any other edge rusher this year and currently ranks third among players at the position with a pass-rush grade of 92.0.